The Morning Star Company is a world-leading vertically integrated food processing company. We began in 1970 when Chris Rufer, our founder, opened shop as a one-man owner/operator trucking company, hauling tomatoes from fields to tomato factories in California. We've grown rapidly and, today, are the world's largest processor of tomatoes, with vertically integrated operations ranging from fields (greenhouses, transplanting operations and farming operations), to harvesting and transportaion, and finally processing. We have facilities located through California's fertile San Joaquin and Sacramento valleys. The best human organizations are those in which people aren't managed by others, but in which participants coordinate among themselves, managing their own relationships and commitments to others. Chris reallzed in the early days that this new way of organizing, while it was attractive to all involved, and made intuitive sense to everyone within the company, would be easier to achieve when we were small. So, soon after those first colleagues laid out the idea of a fully self-managed enterprise, Chris came up with the idea of a document--a contract of sorts--between colleagues. It wouldn't be a job description, or an employment contract. Rather, it would be a tool that each colleague would use to outline his commitments to his fellow colleagues. Central to this idea of self-management was the realization that in an organization of any size, almost nothing happens in a vacuum; there are countless interdependencies amongst colleagues, and the strength of the organization depends on the degree to which each colleague clearly defines his commitments to his colleagues--and the degree to which he lives up to those commitments. Steppingstones: identifying the key measures (Morning Star lingo: "Steppingstones") by which the colleague gauges their performance in accomplishing those activities that they commit to, as well as the accomplishment of their mission. In the early days, the CLOU was exactly what is implied by the name: a letter--a paper document that each colleague filled out, at least annually, and then reviewed with his CLOU Colleagues to ensure agreement. As the company grew, though, and expanded into new areas with additional locations and an exponentially greater number of colleagues, it became evident that, while the fundamental premise was sound, and was built on a philosophy that all involved were even more committed to (it had, after all, helped to build a very successful company--and colleagues loved it), the CLOU document in its current form wasn't going to work in the long-term. A paper document filled out annually was a great start, but was easily forgotten--especially when you had a dozen colleagues you worked closely with. And so, when responsibility for a particular item was unclear, there was a need to go back to the "file" and pull out the current CLOU. Which prompted another pain point: Morning Star was growing...rapidly. Change was a constant, and an annual review of CLOUs was good, but wasn't nearly often enough to reflect the rapidly changing nature of the enterprise. So more often than not, change or uncertainty would breed hesitancy, and evenually someone would step in and just take on the issue at hand rather than circling back to the responsible colleague to try to address the performance gap (remember, we're self-managed, which means we are responsible for addressing failures of our colleagues to live up to their commitments; no "annointed" manager to run to). This was the state of things when, In 2006, I rejoined Morning Star. My recent business experience had birthed in me a passion for effective organizations, and when I came aboard, I wanted to work on advancing Self-Management. Chris laid out a vision for a more dynamic "digital" CLOU, and I began working on an outline. A few short months later, a new colleague, Ron Caoua who had extensive systems experience, came aboard to build the software. The impact of the software was subtle, but important. First, it's dynamic; it has the ability to reflect the real changes in content or context of individual's responsibilities within the enterprise. In fact, a CLOU can now be changed daily, if necessary. Further, it allows colleagues to immediately view their colleagues' CLOUs--giving a much more ready view into who is responsible for what--even if a colleague isn't directly related to you. It, essentially, makes the world that is Morning Star a lot smaller. For example, a colleague recently was telling me about an email he received that, initially, made him a little angry. It referred to problem the sender was having, and the sender was seeking his help in rectifying the particular problem. His initial response was to write a terse email in response that basically said, "this is YOUR job; figure it out and stop trying to pass the buck." But before he hit send, he decided to take a look at the senders CLOU; he was surprised to learn that the issue the sender had sent him wasn't any part of that colleague's Personal Mission. In fact, the sender had taken initiative to try to recruit my colleague, who they felt had the requisite expertise, to take care of the issue--a pretty important customer issue. My colleague spent some time looking through the CLOU system, and was able to identify someone whose mission the issue was somewhat related to; he approached them, outlined the issue and the needed change. That colleague ended up modifying his CLOU to incorporate the necessary process change. Our vision has always been to have a system that is foundational to how our colleagues coordinate, and we've made huge strides toward that vision by turning the CLOU into a more dynamic, social network based software. But implementing the software also served to expose new opportunities that we are currently working to take advantage of. First, we realized that the network element of the CLOU could be enhanced if we could incorporate a colleague rating system into the software. In 2010, Ron and I, working with an outside software developer, rolled out a colleague review system that allows colleagues to review their CLOU Colleague's performance. The review (which is open--not anonymous) asks each person to provide very detailed feedback directly to each of their CLOU colleagues regarding that colleague's individual performance and success in achieving their commitments to the rating colleague. 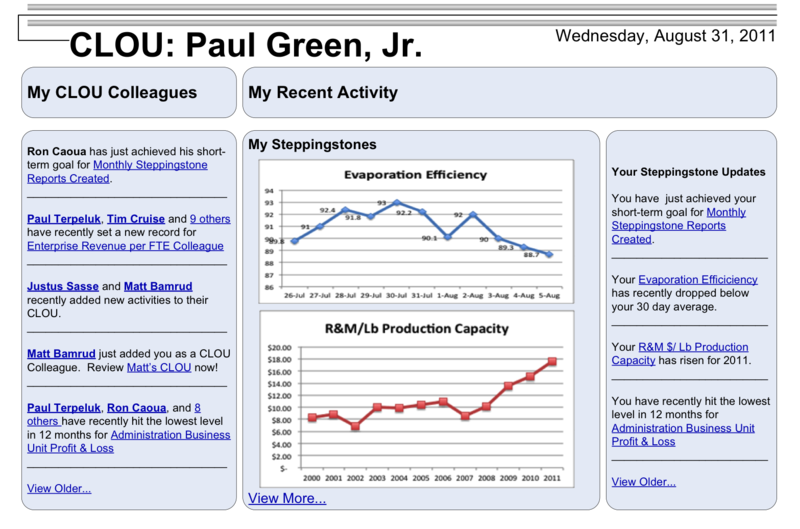 We also, just this year, rolled out a web-based system called "Steppingstone". This software will serve as the backbone for our enterprise metric reporting. Our philosophy has always been that continuous improvement requires detailed performance reporting to each individual within the enterprise of data relating to each activity that they have accepted responsibility for. Steppingstone data historically, though, has always been fed back to colleagues through a melange of reports and systems, and hasn't historically been integrated into the CLOU software in any way--other than that colleagues list those steppingstones for which they commit to take responsibility from within the software. We realized that what we have in place now is only the tip of the iceberg. Our revised vision for CLOU--which we are currently working on--completes the "loop". In our next version of the software, colleagues will be able to draw from a "menu" the specific activities that they are committing to. The software will still have the flexibility to allow any colleague within the enterprise to expand on the menu (that is, it won't be "locked down"), but edits will be to the "master" map of the enterprise, and colleagues will then associate themselves with segments of that map. This will enable a more graphically intuitive view of the enterprise, and the colleagues responsible for each area. Equally important, though, is that when a colleague takes responsibility for activities by selecting them into his CLOU (in the forthcoming version) the corresponding Steppingstone measures will come along with those activities--as well as the relevant reports. This incorporates live (or close to real-time) reporting directly into the colleague's CLOU. Our vision is that the "home page" of the CLOU will turn into a sort of scrolling "feed" of information. Your home page will update to show updates to key Steppingstones, as well as a running feed of Steppingstone information for your CLOU Colleagues. How do you create a platform to enable effective self-organization amongst colleagues? CLOU, as a concept, is really central to how we organize at Morning Star. Conceptually, the idea of the CLOU isn't intuitive for many when they come aboard (and, in fact, we have integrated a CLOU planning segment into our Self-Management Orientation that all colleagues participate--and we have a handful of colleagues who are designated facilitators to assist colleagues, especially early on). But once colleagues understand the CLOU, and really embrace, it becomes central to the way they work--in fact, while you don't necessarily hear colleagues discussing their CLOUs on a daily basis, they are really a central theme in colleague planning and coordinating conversations and discussions. But, as indicated above, the static version wasn't quite as robust as we desired. CLOU version 1.0 has served us well, but we realized that it's more than just having an accessible platform to store and maintain CLOUs; the system needs to be dynamic--and actively feed colleagues performance information as it's happening--both their personal information, as well as that of their CLOU Colleagues. That's really the core of the improvements we are building now in CLOU 2.0. I don't think that we could ever have envisioned this dynamic "feed" of information, though, without building this first version of the software--in large part because this network of relationships is fundamental to the "feed" concept. Creating an organizational structure that's built by colleagues within the enterprise, but ensures we have "all the bases covered". This is one that we didn't really envision when we set out to build the software. The initial version of the software was structured so that all entries--all activities and all Steppingstones (performance measures)--were free-form; they were, essentially, created by the colleague creating his CLOU. That's an OK way of handling it, and it actually has worked just fine, historically, but awhile back we begin to brainstorm, and ask ourselves, "can this tool be used to provide a clear picture of both 'who-has-what on their plate' as well as 'are all the bases covered'?". Our new version (the 2.0 version that hasn't been released yet) is built on a process platform. We've created an architecture that describes the enterprise in terms of process--and sub-process, and sub-sub-process, etc... And we've associated each of our vast number of Steppingstones (performance measures) with those processes and sub-processes. We're building a graphical interface that colleagues can interact with, both to accept responsibility for some process or sub-process (and the related Steppingstones) OR review who has accepted responsibility for them. The underlying process architecture is still managed and maintained by everyone in the enterprise (in fact, it is handled something like a wiki--open to all colleagues to modify/add-to/subtract from as appropriate), and, in fact, the whole initial process architecture was populated by the colleagues across the enterprise. This was important to us because the process map of the enterprise should really be representative of all of the collected wisdom within the enterprise. Organizing is easier. Clear roles and responsibilities--and the ability to quickly, and openly, modify those roles and responsibilities, has greased the skids of the planning and coordinating process, and has made peer-regulation a little less challenging for colleagues. "Real" Hierarchies are more visible. We don't have formal hierarchy; rather, we believe authority should flow to you, willingly, by your colleagues, based on your expertise and achievements. This platform allows individuals to freely associate with colleagues based on their perceived abilities. The CLOU software, combined with our peer rating system and end of year compensation process, has begun to make visible the "natural" hierarchies that exist within the enterprise--and further, allows a clear view into the context of those hierarchies. Peer-control makes for a more cohesive group of colleagues. Our philosophy is sometimes mistaken for a "lack of management". That's not the case at all. We like to look at is as management rich. We ask everyone to become effective managers of their own mission, activities and CLOU relationships. That means they have to plan, coordinate--and sometimes even, deal with difficult performance issues--directly. But building a system that facilitates that planning and coordination to some degree has provided colleagues with a basis for peer-control, and has, in a sense, made this peer-regulation a bit easier. The Strength of Self-Management is in the relationships between colleagues. We initially set out to create a basic software to allow CLOUs to be readily available, and more dynamic--and we achieved that. But the experience really brought into very clear focus the idea that the strength of the structure really depended on the strength of the commercial relationships between colleagues. Ironically, this idea that individual commitments between colleagues makes for a stronger organization has always been central to our philosophy, but our experience here really intensified this idea--and caused us to realize that the potential for this type of platform was enormous. Our current enhancements are really meant to further strengthen those relationships. Imagine it as a social networking application of sorts, where your CLOU Colleague's individual performance information is piped to you as it is happening, and where you provide direct, subjective feedback to colleagues within your network. The technology here is key--and is really helping us to grow without sacrificing our principles of organizing. Below are a few relevant attachments. As colleagues develop their CLOU, and make CLOU commitments to other colleagues (to their CLOU Colleagues), they develop a network of sorts. Morning Star's structure emerges from that network of relationships--the network formed by participants in the network, as opposed to a master planner who maps out the more traditional org chart. 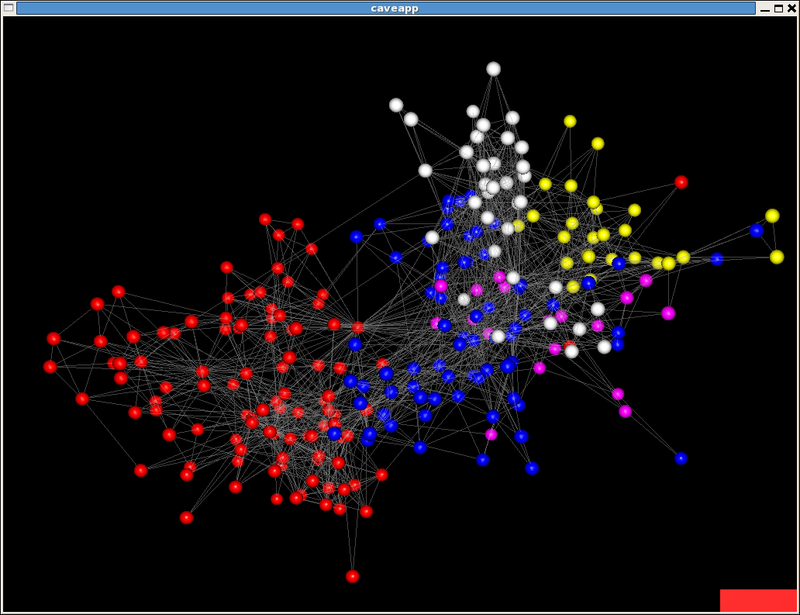 The image below is a network map depicting the CLOU relationships of a subset of our colleague population. Names and other identifying information isn't shown (for privacy reasons), but the network is color coded based on physical location. Each node in the network is a person, and the lines connecting nodes is a confirmed CLOU relationship between colleagues. The video below shows a few brief clips of Rufer, during a recent interview, briefly discussing the philosophy underlying the CLOU process. To learn more about the Morning Star Company, visit The Morning Star Company on the web. The CLOU at Morning Star from Paul Green, Jr. on Vimeo. Congratulations ! It's a great initiative . contains a few typographical errors. Would you be open to my offer to assist in correcting the errors? various ideas that I might use. Thank you. I think CLOUs are a very interresting idea, but it is still difficult to imagine exactly what they might look like, or imagine how I would write one myself. I would love to see some sample CLOUs for various roles! And how detailed do they have to be? It seems to me they might range from very general role descriptions, down to overly detailed listings of every single thing you one-time unexpected request from collegues that you are going to spend a couple of hours on. The more detailed, the more often the CLOU would need to be updated. Can you make it general enough to not need constant updating without being too general? What is the proper level? Your style of self-management appears to be a further application of accountability which is rapidly becoming the new style of successful companies. The individual is directly responsible for his/her role and duties within the organizations and in fact his/her success. The peer reviews are a true gauge of how one is doing. Who better to give feedback than your peers? When the door is open for such interaction and open discussion, a true measure of how the individual is doing can be made. If this is throughout the organization, then nobody should be caught off guard. Regular open, honest communication should be made so as to not fall into the pitfalls of the annual review when people walk out wondering what just happened. It's the first story I’ve read where a self-management project deals with the heart of the problem: responsibility. A company, when it adds value, takes on many contractual commitments and implied commitments- say, to deliver on a particular day or meet a particular quality target. Yet the “company” is just a legal entity, the problem for self-management is always *who* has the responsibility. Your approach using a CLOU tackles this problem head on. I think the use of software was inevitable as the complexity and dynamic nature of the commitments grew. At its heart your CLOU idea addresses one of the fundamental cornerstones of self-management- and it’s a tough problem. You have done good work. Congratulations on your accolade, but also on your courage. You are an inspiration to all practitioners struggling with these sorts of issues. Thanks, Julian, for your comments. You've hit the nail on the head: responsibility is really the key. I appreciate the insight. It seems to me, there is still some bureaucratic tinge to CLOU. This private company is still owned by one person. "Self-managed" does not mean "self-owned". In conflict with the SB-657 disclosure, I see an exploitation of all colleagues, against the determination, "to eliminate slavery and human trafficking" by not practicing, " the highest standard of integrity, honesty and compassion", to-wards each other. Am I the only one to feel this way? As a Morning Star colleague, I certainly don't feel that way. I do not see the logic that takes you from acknowledging that the company is owned by one person to an accusation of slavery and human trafficking, unless you are under the mistaken impression that we don't get paid for our efforts. http://www.morningstarco.com/public/SB657-Disclosure.pdf ), posted on your company's web site, might become relevant. Since such information is not divulged voluntarily for the readers like me to understand and know, all I can do is, draw attention to this vital missing data with the hope the responsible will be more forthcoming and reveal/assure that it is. Isn't the reason, acts such as the SB 657 become necessary due to the widespread existence of multiple standards, secrecy and an unfathomable amount of inequities that divides our humanity into the 1% and the 99%? 1. Great question, and the short answer is no, not really. We have a whole philosophy around this--that perhaps I can write about here as a story somewhere--but the short answer is that if a person sees this sort of organization as an abstention from their career, they aren't right for the organization. I'll be absolutely frank with you here: a career aspiration as a "manager" doesn't strike me as a lofty vision for life. Climbing the corporate ladder doesn't really seem like the makings of a fulfilled life. As an exercise, do this: make a list of all of the people you can think of who have really made a noteworthy impact in their domain of expertise--world leaders, sports stars, innovators, entrepreneurs, inventors, writers, artists, leaders of change movements--doesn't matter the domain. Now, how many of the people on the list are notable because they were effective at climbing the ladder? Being a good "manager of others" doesn't really count for much in the big scheme of things (sorry if that upsets you). We believe that management of others just gets in the way of the stuff that really counts in the big scheme of things; we want our people to focus on doing the stuff that matters--and if we can build an organization full of people who don't NEED management by others, then everyone can focus on doing stuff that'll change the world. So if you're struggling to convince someone that they need to abandon the ladder, then either they aren't the right fit, or you haven't done a good job at showing them that there's a deeper mission that needs a champion, and that there's an opportunity to be a true leader built into it. 2. I can't really offer any proof given that we're a private company (I hope you can understand this). 3. Not correct; the colleagues who sit on the panels vary widely, depending on the circumstances. 4. Long, hard question to answer. Perhaps you can drop me a note via email or on my inbox here on the website, and we can strike up a conversation? This is a great story, fascinating! It is systems intelligence. I wonder how to place this in perspective of changes in organisations. How to implement this piece by piece or step by step. Because every organisation comes from another place when they make a start or want to work with selfmanagement, as well individual as in teams/groups/organisationwise. How about connecting organisation competencies? or business philoshophy? I am very interested to hear more about the software too and about the integration with private social media. We are starting to working with it in europe (social innovation projects) and I would love to bring up the story as an example or case. How are Morning Star and the CLOU's doing now as the story is from appr a year ago? What a fantastic story. I'm responsible for staff personal and performance management in my school. I'm definitely keen to implement this ideaof shared responsibility but would really like to hear more about the software that your are talking about. Thanks for the comment. I'm happy to share more about the software with you--and, for that matter, anyone. You can feel free to drop me a note (contact via my profile), but I'd also love to hear from you (and anyone) through comments here on the board as to the key questions you have. I'd love to expand the story to be more descriptive and really get at the practical questions that you and others might have. I quite like this. There's nothing that new about using commitments - Diageo for instance were using promises between their employees well over a decade ago. But supporting this through a SNA and system is I think quite novel. Thanks for the note. I would agree that, in many ways, your model is similar to what we have worked to do with the CLOU. But not entirely. The CLOU is a very central part of our organizational model, but what you propose I think has the potential of pushing the costs of organizing to a point at which they're unsustainable. What you are outlining is similar to a marketplace--and theoretically, I like that. But it seems like if you drive this to a point of minute granularity, where a formal negotiation and documented agreement has to happen for every task, it may become too costly. I liken it to the contrast between buying a house and buying a burger: when you buy the car, you search around for the best deal, haggle quite a bit (perhaps with a few different dealers), and triple check the contract before you shell out a dime. But when you decide you want a burger, you simply find a fast food restaurant, order, pay the 7 bucks, and wait for the food. No contract; no haggling (I hope! ); yet you still shell out the money. So I guess I'm not arguing at all with the concept, and actually agree wholeheartedly with the fundamental premise. But many (perhaps most) of the interactions and commitments within an enterprise shouldn't need to be documented, stored--or put into a system as part of the "committing" process. Neat concept; would love to chat about it at some point. I take your point, and I also describe this issue as a matter of "granularity". Small tasks (e.g. can you draft a memo for me by tomorrow morning) certainly do not merit tracking. Tasks and deliverables have to be of a certain size, or weight, or importance to benefit from rigorous follow up. I would probably argue for a lower threshold than you, but that's ok. The beauty of our solution is that each user decides for themselves what they want to track. It's not a corporate dictum. Cost and benefit is determined by the individual user. FYI...my regular email is arella@4spires.com if you'd like to arrange a chat. I'm new to MIX, but could not resist commenting on your story from last year. I concur that commitments are the new way to manage, but I'd like to suggest some extensions to the system you've devised. As I understand it, Mr. Rufer developed the CLOU concept to focus and clarify roles and responsibilities. He definitely had it right - instead of being assigned tasks, colleagues accomplish more when they make commitments. If I read your account correctly, however, there were occasions when things fell through the cracks and there was difficulty clarifying accountability at the more detail level. My suggestion is to extend the same concept down to the level of tasks and deliverables. For some time now, I've been working on a similar paradigm called commitment-based management which expresses organizations as a network of interrelated requests and commitments to deliver. One person (the requester) makes a specific task or outcome request of someone else (the performer). The performer is obliged to make an explicit response, i.e. agree to deliver on the request, decline, or make a counter-offer. Presenting the performer with the opportunity to negotiate their delivery commitment clarifies ownership and assures accountability, not to mention increases the likelihood that the delivery will be made on time. Taken broadly, the whole organization can be seen as a network of these conversations around negotiated commitments. The principles are the same without regard to formal hierarchies; requests and commitments can go up, down, or sideways. Commitment based management has been described as the most important new management principle to emerge in the last several decades. These simple, but profound innovations in work management, pioneered by Fernando Flores and Terry Winograd in the 1980's, have been profiled in the Harvard Business Review, MIT Sloan Management Review, and the Wall Street Journal. Software technology to facilitate and track these conversations for action is coming which will improve coordination, visibility into execution, and accountability by presenting a clear picture of who will do what by when. Negotiated commitments are visible for review. These innovations also increase trust by capturing performance metrics and exposing patterns of behavior. Getting commitments clarified regarding roles is a good start. Driving the idea down to the task level completes the story. Check out my blog (www.4spires.com/blog) if you'd like to learn more. Jordan: Thanks for the note. Great question. We have around 350 year round and 2500 partial year employees. I think that if we were to roll this out on a larger scale, there would be a few changes (some of which we are working to implement now as we continue to grow). I think that, from a "look and feel" standpoint, we'd probably structure the software a little more like some of the social networking platforms that exist now on the web. We'd also probably make it a little less "free-form". That is, we'd probably lay some of the structure around our existing businesses into the software and allow people to "drag and drop" their roles into their CLOU as opposed to simply crafting it, free-form, from the ground up (hard to explain without delving into the software, but hopefully that makes sense). There would be a few add-on features as well, but those are things that we are building on now as we continue to grow. Hope that helps! By the way: yes; I would agree that the CLOU system requires less infrastructure/cost than a traditional performance management system. Thanks for the question. I'm assuming you're talking about the CLOU System. If so, it's very effective. It's interesting; it's become a sort of cultural trademark. It's not one of those things that people hop on and look at every 15 minutes, but it's kinda the foundation of our organizational model. The CLOU itself has been in place since the 1990's, but the software was first implemented just a few years ago. Thanks for this wonderful story! Just wondering, how effective is t his system? How long has it been in place? Have you seen any side effects? Are there any dependencies (e.g. the right people in the firm in the first place, or high salaries, etc)? Thanks for the question. Your question has two elements; I'll try to answer both. First, compensation is difficult (in that many jobs do not match a "normal" job; they are a combination of a variety of functions). We have a few folks on board who are "experts" in compensation, and we try to keep a salary database up to date (with regional salaries by function) to enable colleagues to ensure their compensation is up to par with the industry. The second part pertains to compensation adjustments. To make a long story short (and to breeze by a LOT of details) colleagues make a case for compensation adjustments (based on additional functions they've taken on or better-than-expected performance); their CLOU colleagues provide peer reviews of them (open reviews; no anonymous reviews), and then a group of location colleagues get together (the group is selected by the colleagues at the location) and go through the requests along w/performance reports and peer reviews and "validates" the request.